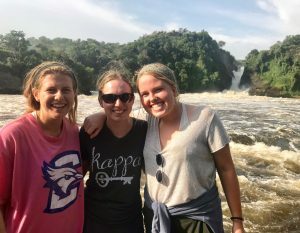 From left to right: Lizzy, Izzy (moi), and Natalie in front of Murchison Falls. Backpack Journalism has effectively ruined me for life. Don’t get me wrong – this is the good kind of ruination. The kind born from an experience that challenges you, breaks you, then puts you back together in a new and profound way. The kind developed under intense pressure and onslaughts of discomfort, in addition to the goodness you discover in unexpected places. A ruination that shatters your former self, thrusting you into a reality once hidden from you; an entire world that forever captures your heart and refuses to let go. In this case, Backpack Journalism ruined me by opening my eyes to the harsh reality of suffering on the margins. I have witnessed desperation as starving refugee families flocked to food distribution stations, clinging to their monthly rations even though the food they received was barely edible and gave their children horrible stomachaches. I have witnessed mounting frustration as non-governmental organizations struggle to provide basic services on decreased budgets, a result of outside donors losing confidence in the operation or choosing to funnel their money elsewhere to other conflict areas. I have witnessed abject poverty as South Sudanese crossed the border with absolutely nothing save the clothes on their backs; as single mothers lamented their inability to pay school fees or even purchase soap for their children; as youths who were unable to continue their education sat idle around the settlements, their boredom a strong temptress for returning to South Sudan as a soldier or a wife. Witnessing this suffering has drastically changed my perception. I no longer feel like the outsider who tries to stay informed and advocate for the social issues that affect marginalized individuals, all the while exercising my privilege to observe and comment on matters I have not personally experienced within an open intellectual space. Instead, witnessing has made this suffering real, tangible. These injustices are no longer just appalling statistics. These people are no longer nameless victims of an overarching narrative. Feeling powerless is no longer a foreign emotion. For better or worse, I am no longer oblivious. I am ruined. Ruination is jarring, to say the least. Certain things start coming into focus – your values, your weaknesses, maybe even your lifelong purpose – while others become harder to see. For instance, I’m having a difficult time seeing how I can reconcile the reality of poverty with the blatant materialism and blissful ignorance that pervades Western culture. I’m also finding it challenging to regard fellow privileged humans with compassion – a side effect I didn’t anticipate when I committed to Backpack Journalism. Let me explain. On our last few days in Eastern Africa, our Backpack Journalism crew enjoyed some relaxation time at Murchison Falls National Park, the largest national park in Uganda and a tourist hotspot for authentic safaris and Nile cruises. While it was nice to take a break from filming, and certainly enchanting to see the wildlife, something felt a little off to me. I recognized that this feeling was caused partially by my shock at seeing white people again. After nearly two weeks of being identified by nationals and refugees as “mzungu” and having few encounters with other white individuals, I was jolted by the abundance of my race at the safari lodge. I couldn’t help finding their presence off-putting as they took multiple pictures of themselves in the same setting (gotta get the right #InstaPic) and loaded their arms with expensive souvenirs. As I observed these tourists, I found myself thinking bitterly: Do you realize that there are people starving a few miles outside of this reserve? Do you know how desperate the living conditions are in the refugee settlements just hours away from here? Do you understand how privileged you truly are? I also found myself feeling extremely guilty. Sometime on our first afternoon safari, I realized that the vast majority of Ugandans and refugees would never get the chance to experience this beautiful game park for themselves, despite the fact that Murchison Falls was practically in their backyards. The sad truth nagged at the back of my mind for the duration of our mini-vacation. Here I was, enjoying the experience of a lifetime while nearby people were engaged in the experience of an unfathomable financial insecurity that would probably outlast their lifetime. It was utterly unfair and profoundly disturbing to me. First, ruination doesn’t resolve inner turmoil. Instead, it puts you in a perpetual tension with your mind, heart, and soul, challenging you to grow in new ways. I will never be able to wrap my head around the world’s suffering, just as I will never be able to stop the surge of guilt that consumes me once I begin asking deeper questions. There is no way to make sense of these things. The important thing, however, is to never stop acknowledging these issues – to never stop caring about these inequalities because otherwise, I am consciously perpetuating systems of injustice. Second, don’t let ruination become a new source of pride. It was so easy for me to slip into condemnation against the other European and American tourists because I felt more conscious of life on the margins. Their ignorance both frustrated and enabled me to feel superior, a mindset which startled me once I recognized it. I had to remind myself that I couldn’t expect these people to have the same new perspective I did when they hadn’t experienced the same ruination as I had. I also needed my friends to remind me that not too long ago, my understanding of the world was very different, and perhaps closer to the average white American’s perspective than I realized. I had let myself become prideful over my encounter with marginalized individuals when the experience should have humbled me. Condemnation became a method for me to inflate my own ego, and so, I needed to put that weapon down. After all, pride causes more damage than ignorance. Going forward, I’m praying that God will help me respond with love and compassion when my ruined self causes friction between friends and family. I’m praying that He’ll give me the discernment to hold my tongue on inconsequential moments, and to use my voice when it’s needed. It’s a difficult road ahead, but I will never stop walking it. I have loved all your blogs!! Thank you for going so deep and articulating your heart with us. Still praying for you.